Just a quick update as the alternative is no update. 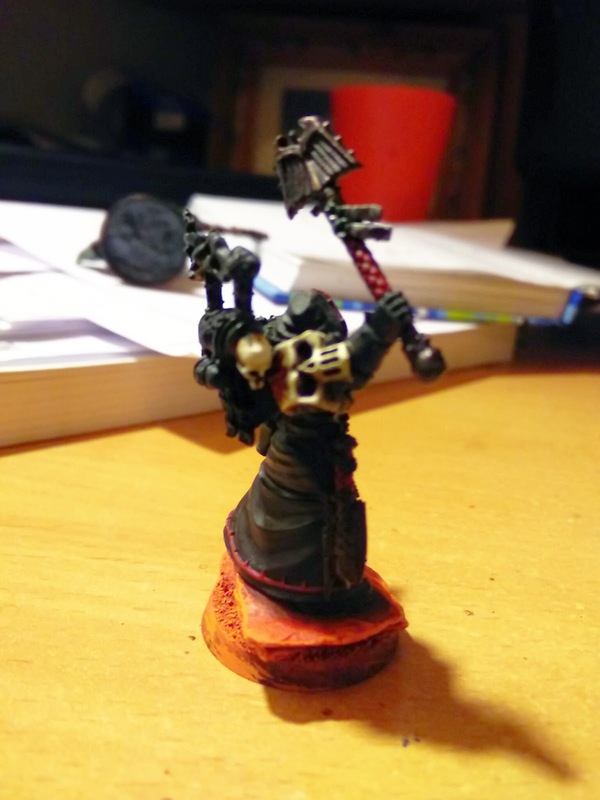 I've actually completed my Interrogator Chaplain Seraphicus but haven't taken any decent pics to showcase. Truth be known I'm a little disappointed with the gloss varnish I've added to his power armour as it's a bit thick in places so it plays merry hell with the sense of scale on the model, but I'll cover that in detail when I take the pics. Meanwhile, I've got back onto doing the Deathwing and I've managed to go from two models with completed Bonwehite highlights to four. I'm really happy with how they've come along, they're lighter than my original AoBR models but that's down to how I'm highlighting the 'nids. It's slow going though, it takes about 60-90 minutes for me to do just one! Still it's the bulk of the model. I am however less impressed with some other colour choices. The black feathers still don't ring true to me but I'll see what a very fine grey highlight will do to differentiate the feathers. 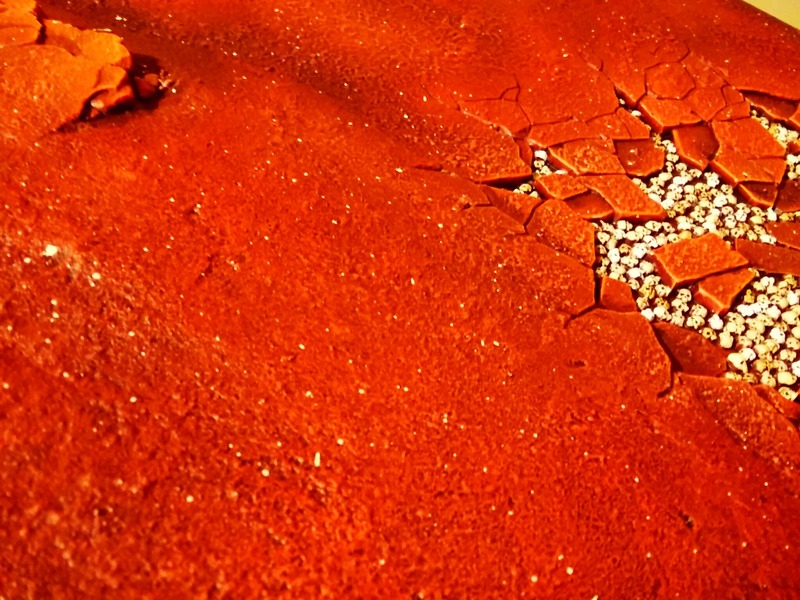 Also some of the reds are getting a bit samey, when I need different shades to represent different materials. I still have a lot of detaill work to do, the odd skull, studs, helmet lenses and some more highlights on the Crux Terminatus to represent the Ferron stone it's mined from. I'm sure these will add quite a few more hours to the process but I'm getting there. With only one model to highlight I'm beginning to see the light at the end of the tunnel. There's no right answer on this as I'll no doubt do units with different colours. Red I think is the obvious choice but opinions are most welcome. Things have been a bit disrupted this weekend [I know it's now Wednesday but fallout still surrounds me]. 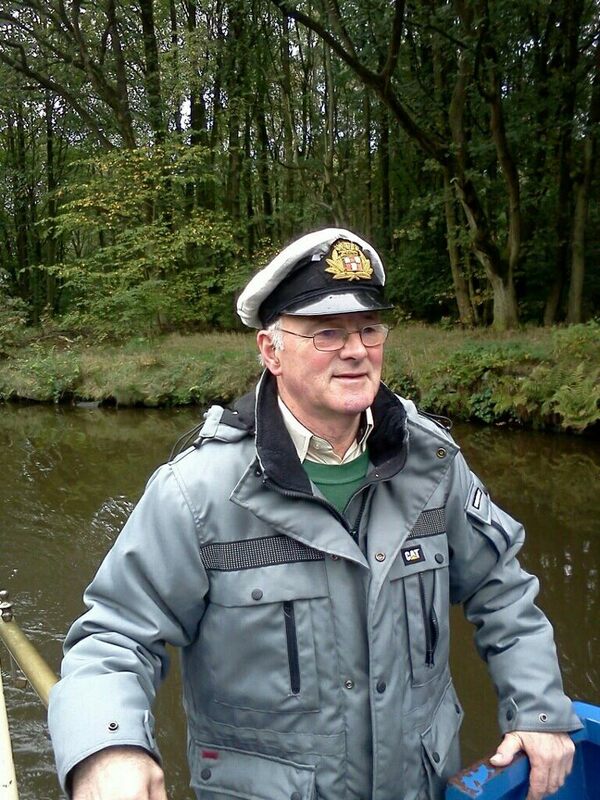 On Friday I thought I had a game with Ben but it transpired I'd not actually confirmed so he'd got Otty to fill in. Kindly he said I could pop along and watch so I arrived to witness potentially one of the most painful games ever. 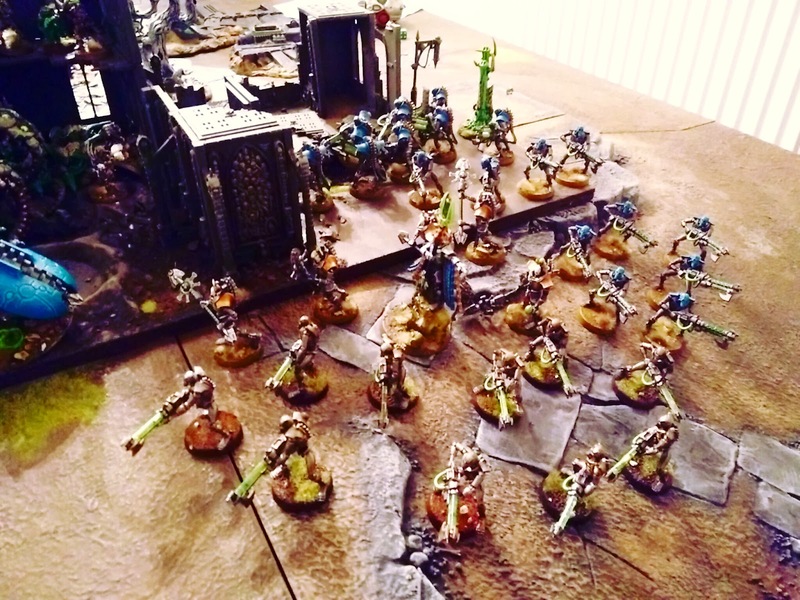 As you can see from Otty's deployment he was tooled up, with a Barbed Heirodule, two Fleshborer Hived Tyrannofex, two Tervigons and 30 Termagants [28 Devourers and 2 Spike Rifles] with 5 Dev Warriors and a few Zoanthropes to boot. Essentially he had a ton of firepower. Essentially Otty threw everything he could at these robots and just couldn't kill them. 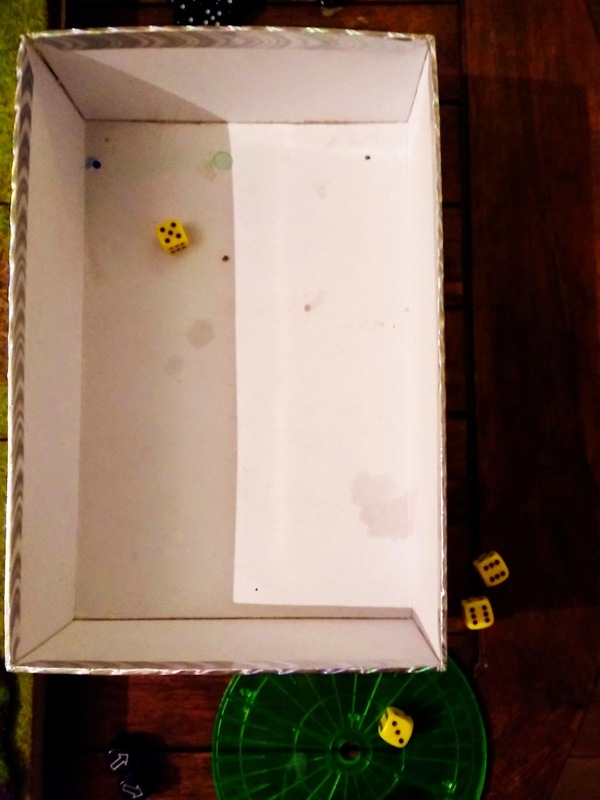 5 would die and then 5 would reanimate, admittedly that's beating the odds but there were so many dice being rolled just none of it was ultimately productive. 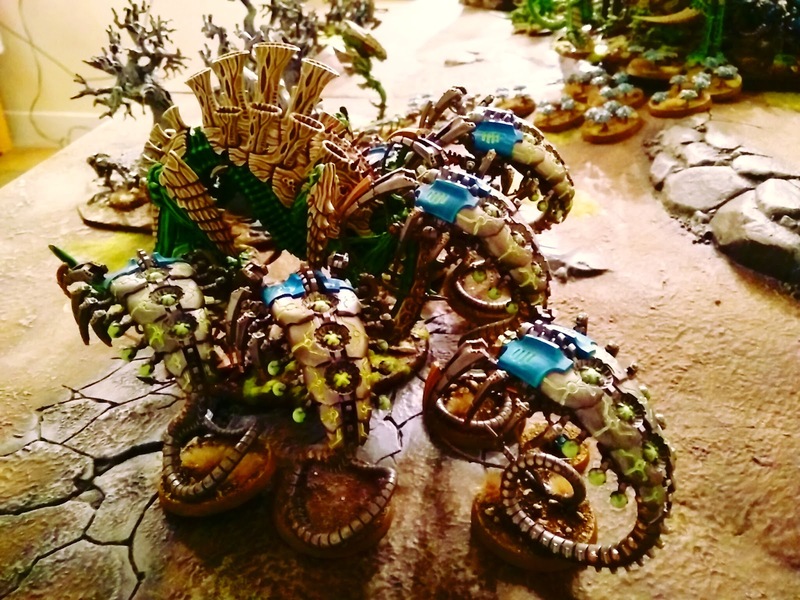 Even playing the Maelstrom missions became pointless because he became bogged down with the highly mobile elements of the Necron force. It some became apparent that there was not a single element of Ben's army that wasn't useful and also durable, zero fat! 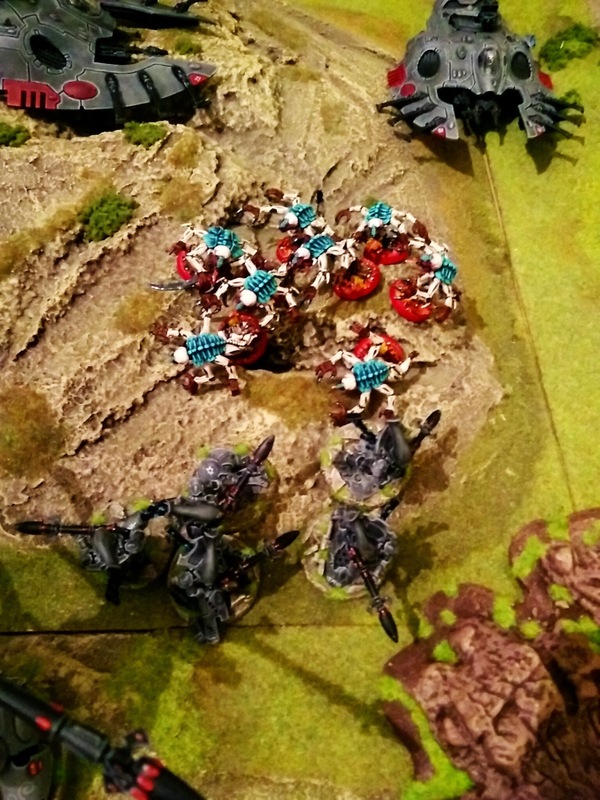 Wraiths with their speed, invul saves and killing power, not to mention that gun they have that was only prevented from insta-killing Otty's MCs by some handy Paroxysm rolls stopping them shooting straight! Even the Heirodule was a little ineffective, although that was more from deploying first and Ben then leaving it slightly out of position to actually making any meaningful effect on proceedings. His 12 high strength low AP shots were still useless in the face of Reanimation protocol. This was never going to end well, although it did take a few turns for the inevitable. I found myself wondering if I could have done any different and I'm not sure I could. You can't hide from them, they're more mobile - they'll hunt you down. I haven't got as much firepower as Otty has and it aided him nought. Air superiority is an option but you lose out on securing objectives when you're swooping. 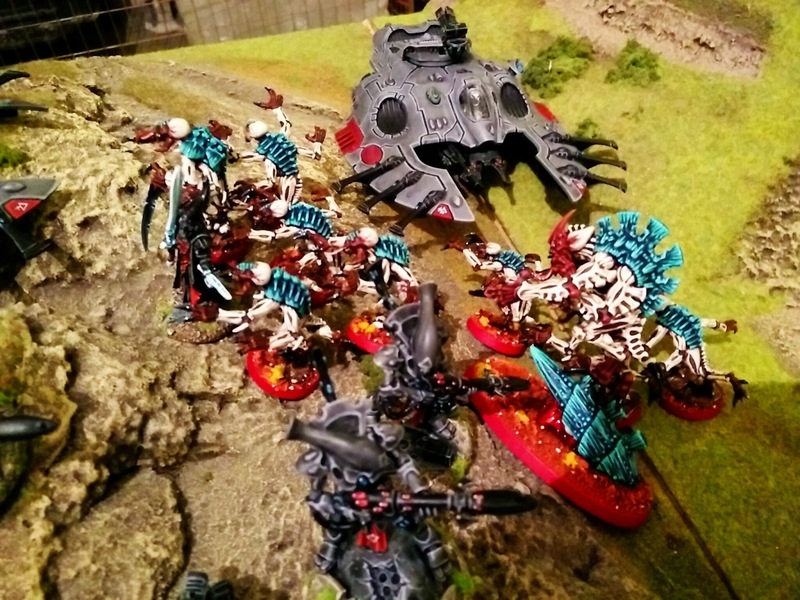 You can't assault because you get overwatched and even then there are assault units that can be even more devastating than the Tyranids very own 'premiere assault unit'! I was literally stunned by the one-sided nature of the whole thing. That's not to say Otty was tabled, far from it, it was just that he loads of stuff that worked really hard for no visible gain. Ultimately the game came to a close at 12:30am and I returned home with a bit of a head ache - lat night I thought. I then spent the entire weekend bed-ridden - nauseous, head aches, joint aches and a variety of other symptoms less appealing to discuss. I was dreaming/hallucinating flashes from the game and also Ingress it was truly horrible. Even today my head is still befuddled and stomach is upset. I had to cancel a short notice game with Ben tonight because I can't manage to stay up passed 10:30 without feeling exhausted. I don't know what it was, whether it was an uber migraine or some viral thing but sadly it's stopped me from any hobby progress. Hopefully there'll be something to follow, although my plan for the month is pretty much out the window - I'll be pleased with just completing the Deathwing or even just one of the characters! Ben has been on my case about the Dark Angels, so I've challenged myself to complete the foot troops from Dark Vengeance this month. Completing the Tac squad may be a bit beyond my capabilities, I'll get somewhere with them, just maybe not finished. 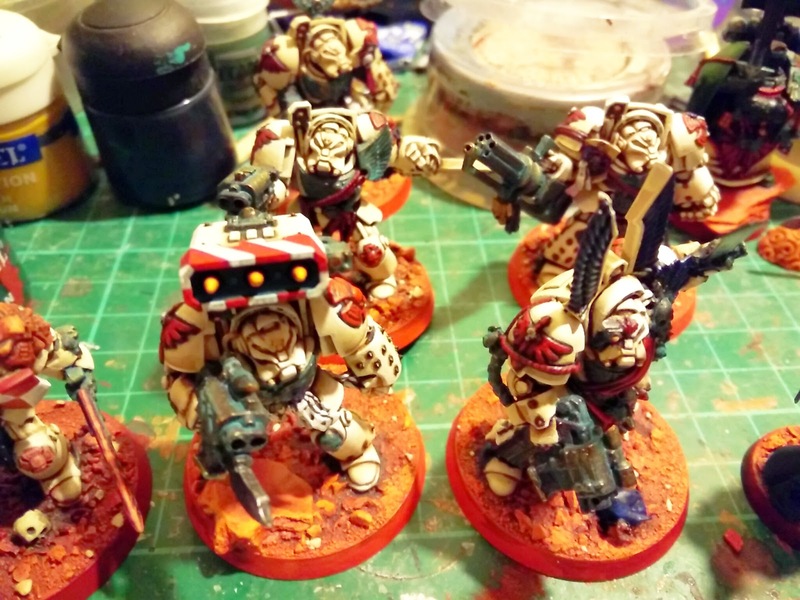 But I currently have the five Deathwing Terminators on my painting table [pile of junk]. 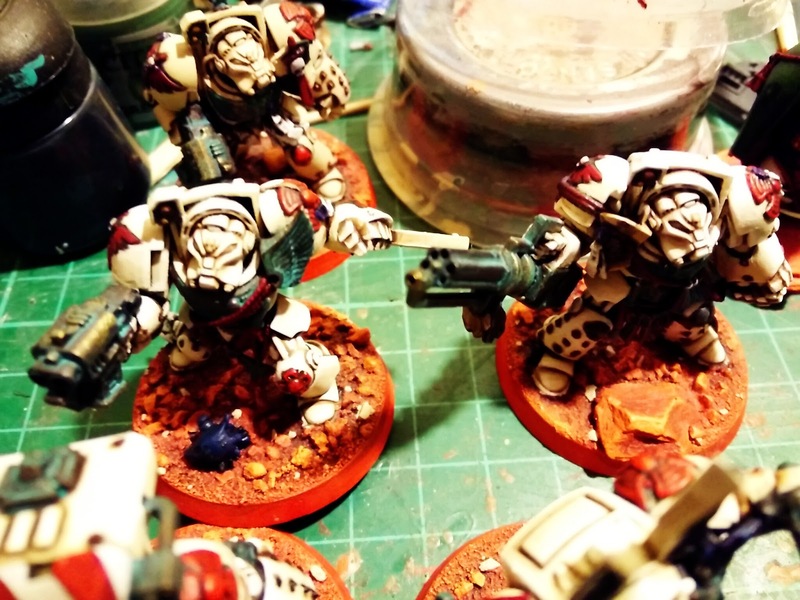 It's slow going because I keep flitting from one thing to another, having to backtrack on bits I've missed and changing my mind on things but so far two Terminators have reached the final Bonewhite highlights stages and for them it's just all the little bits that make it special left to do. As you can see this guy sports a Cyclone Missile Launcher, it's from a Land Speeder Storm. I've still to neaten up the stripes and there's some more verdigris to add to the extra brass/bronze elements I added, not to mention the eye lenses, but I think I'll do all the lenses on the five together so they're consistent. 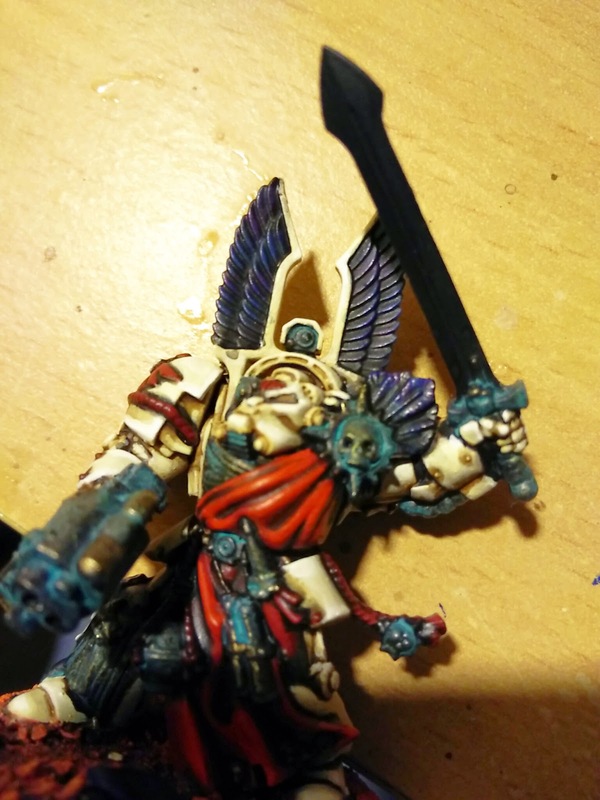 The other 'completed' terminator is the sergeant, still to do his sword, tweak the Raven feathers and some read highlights. I'm not 100% happy on the Raven feathers. I did a quick drybrush with a purple, then added some reflective stripes with a little blue and then added in some turquoise for the highlight. I may add some very fine white reflections but these areas are going to be gloss varnished anyway. You can see the colours a little clearer here. I've added black wash twice to tone down the colours. I think I've achieved what i wanted I'm just not sure it fits the model. I'll persevere with it until it's done, I can always chicken out later and redo them. I'm also doing a number of character models alongside the Terminators, they're on my list, sort of, so that's OK. 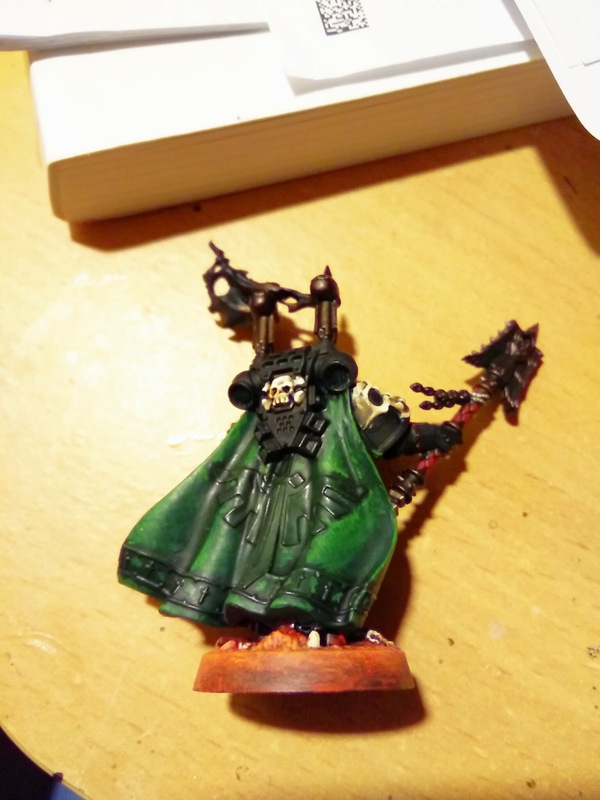 This is DV Interrogator Chaplain Seraphicus [maybe that's the new chaplain we're rumoured to be getting, would make economical sense GW]. 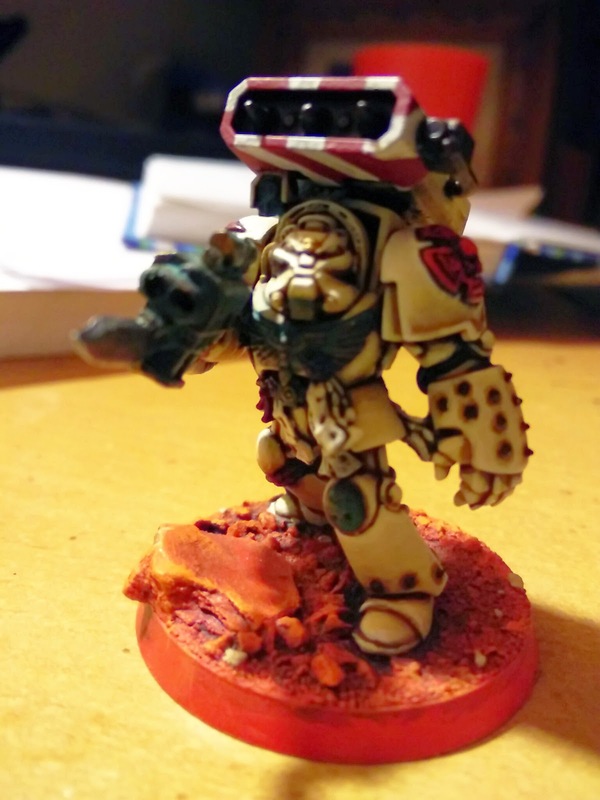 He's really starting to come along now, the helmet in particular is far beyond my expectations. I'll probably be going with red lenses on these - scarier! You can't see much of the highlights on the clock but I did them very rough and pointilised, to try and evoke a textile texture. And Asmodai... another contentious decision, with the only DA green on his pistol holster. Originally I'd done the purity seals red too but thought it was too much. 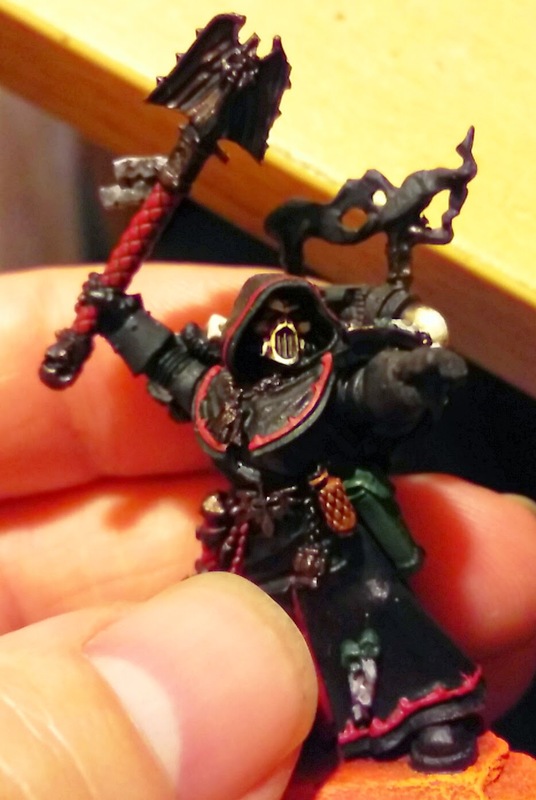 I'd ummed and ahhed over cloak colours and then decided this guy should be old skool all black. 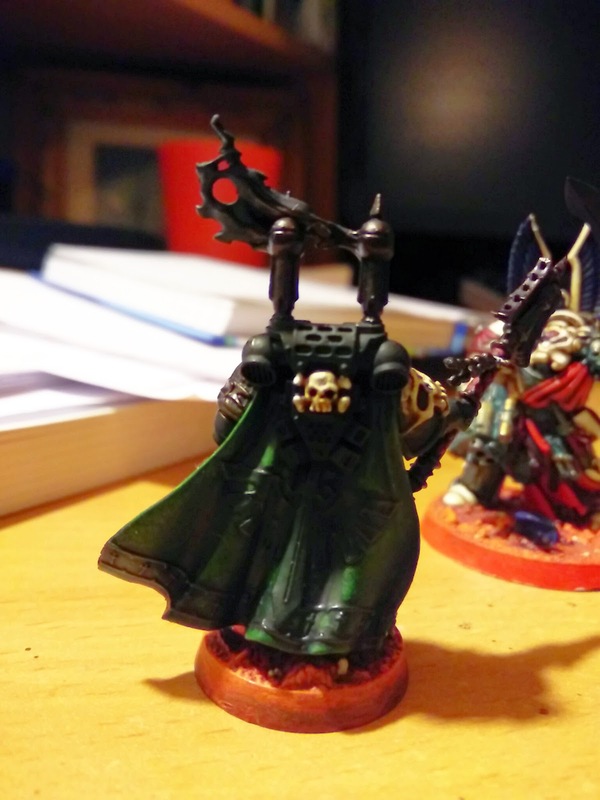 I'm hoping to reference the original colour scheme and that of the Consecrators, who got all the good, black, relic gear. 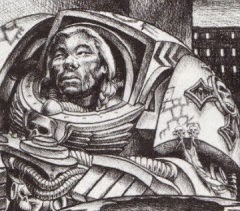 I reckon Asmodai would be wearing some of the original archaic stuff, and super militant about the first Legions heritage, so he's going to be black and red throughout. With obvious bone highlights. 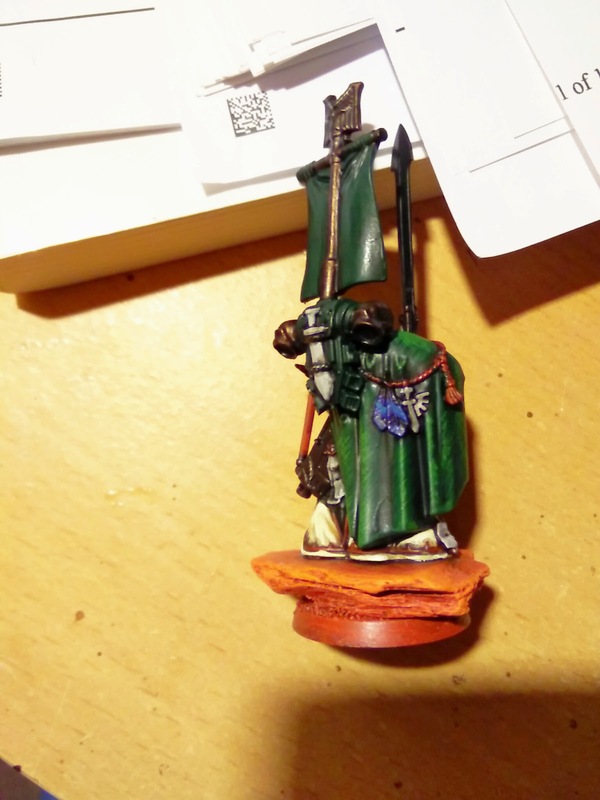 However it does stand out a bit compared with Seraphicus, again wait until I've added some highlights and see what it's like with Verdigris in place. 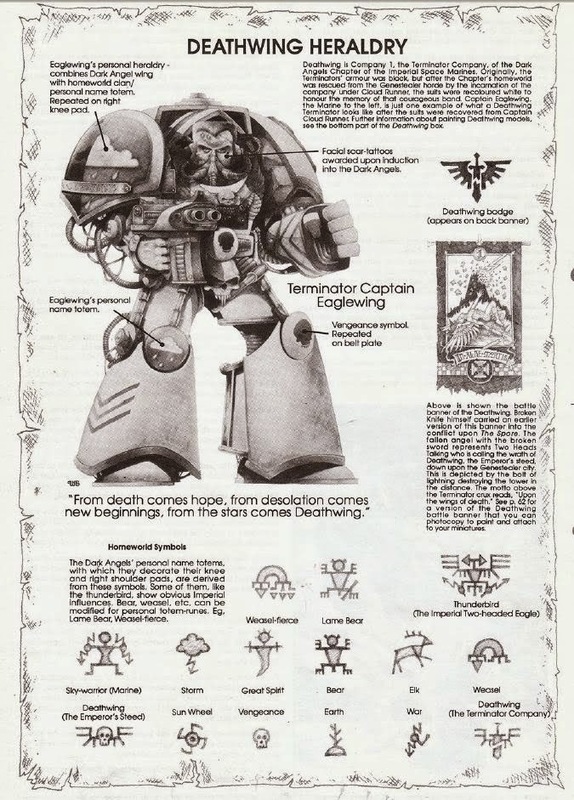 Ultimately I chose Dark Angels many moons ago so I could represent Green Wing, Deathwing and Ravenwing. 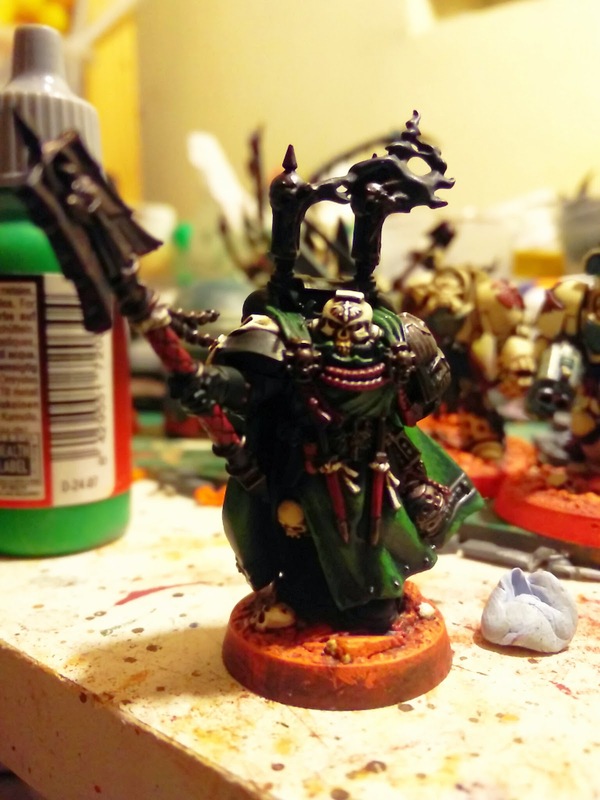 Having that variety to paint different coloured models, I shouldn't balk at the idea he looks different now. 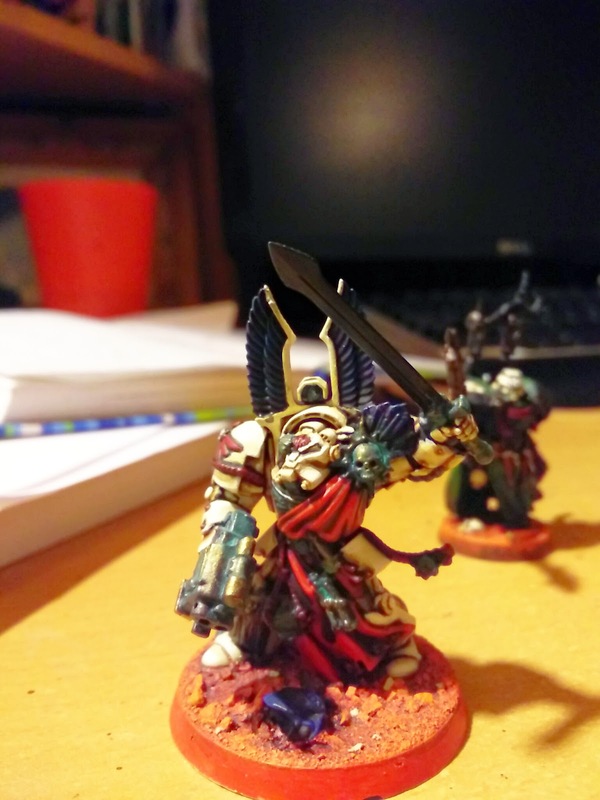 And my Azrael kitbash. I finally sussed his colours, he's managing to show off all the wings. 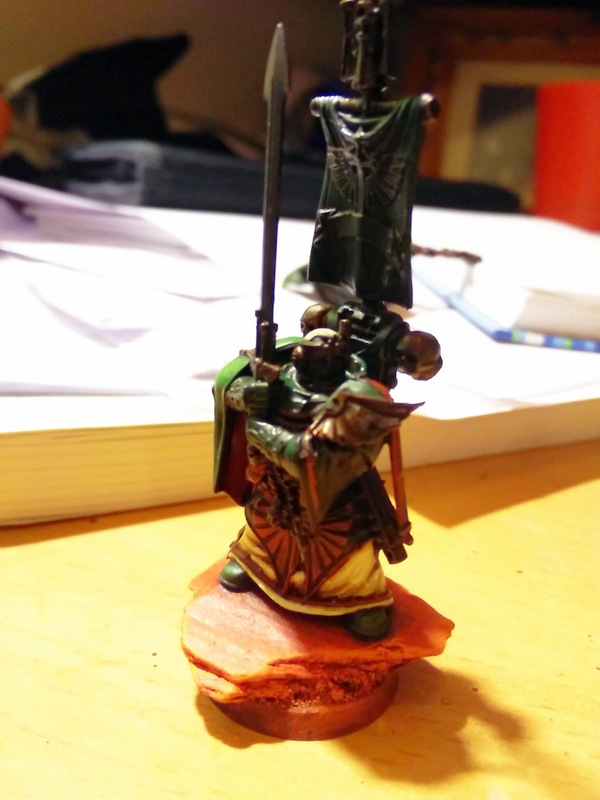 A Deathwing undercoat, with an original first Legion tabbard and then a DA green cloak over DA green armour. I did the rough highlights again, this time managing to get a little bit of hatching going on to pick up the weave in the cloth. Here you can also see the Raven feathers pre-shade wash, again another colour may have helped them stand out a bit more but I'm sick of this idea that all these feathers should be white. 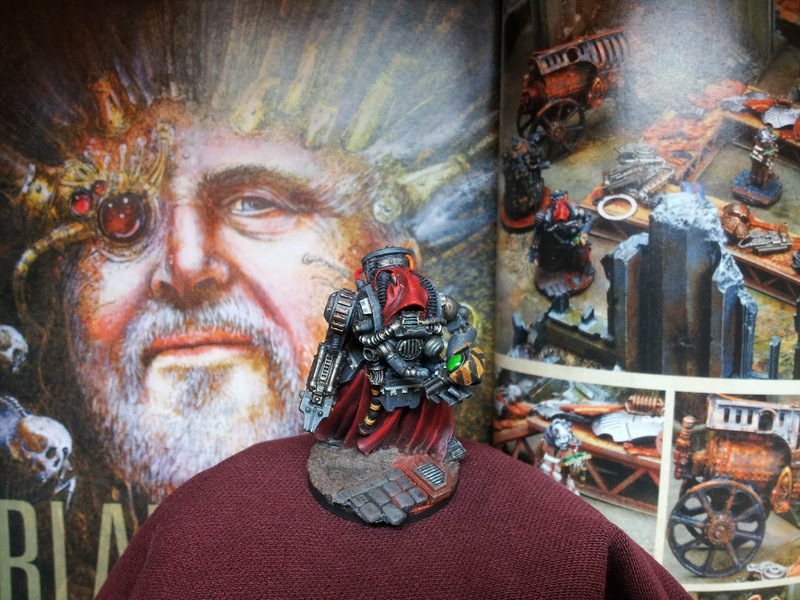 If you've never seen Henry South's blog, or even his models featured in White Dwarf then you really need to get over to 4gotowar.blogspot.co.uk straight away. It's not often you get to see the amazing skills of both an Oscar and Bafta award winner applied to your favourite hobby models. 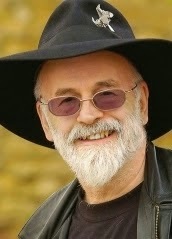 Anyway, when the great Terry Pratchett passed away last month Henry went a little further than an obituary post on his blog, he set up a justgiving page and offered up a raffle of his very own Adeptus Mechanicus models that featured in John Blanche's Blanchjitsu in WD Visions issue 8. But for me it was the fact that Henry is donating the proceeds to the Alzheimer's Society, the cruel disease that Terry suffered from. It's also what my own Dad was diagnosed with early signs. I still can't reconcile whether the fact he was taken from us before this disease robbed him of the dignity he was so proud of, was a hidden blessing. He was dreading the thought of what it would do to him and although his death was sudden and tragic it's difficult to imagine how he would have suffered. Terry himself did a documentary on assisted suicide no doubt thinking about how Alzheimer's would affect him as it progressed. Not for one minute do I wish my Dad wasn't here but I'm just glad he doesn't have to suffer his worst fears. Edward Henry Weston, my Dad. With Mechanicum armies a thing now there may be a fair few people wanting to bring forth the armies of the Red Planet. In which case you should head on over to the freshly forged, Omnissiah approved Red Planet BASE! Facebook group. 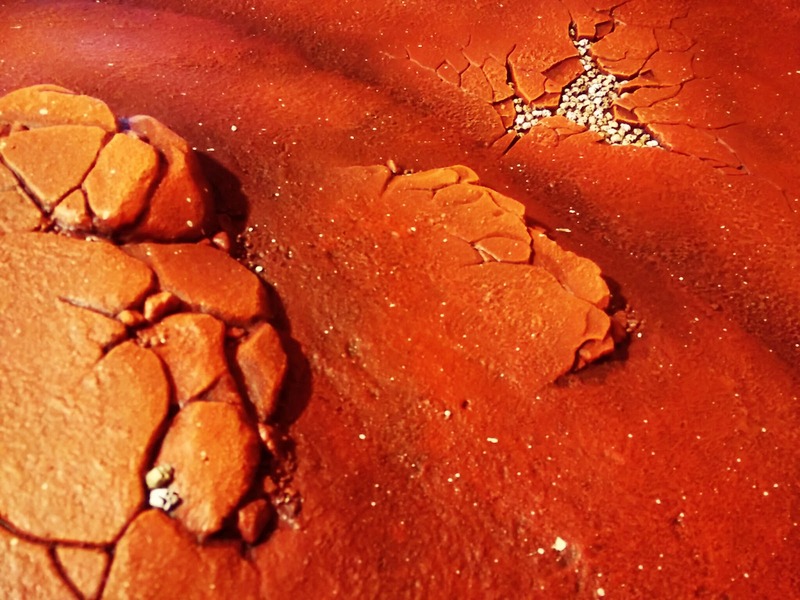 As a big fan of Red Planet basing there's my own tips and tutorials but I'm looking forward to seeing how everyone else gets their martian homeworld effect. This is the first time I've ever had chance to game with Otty, outside of our own mini tournament events. As a paramedic with four kids and recently moving house he's got plenty on his plate so it's always been difficult to fit in around all the other commitments. However, that all changed the other night and it was a glorious game. Warlord Trait - Warlord and three units have Infiltrate! 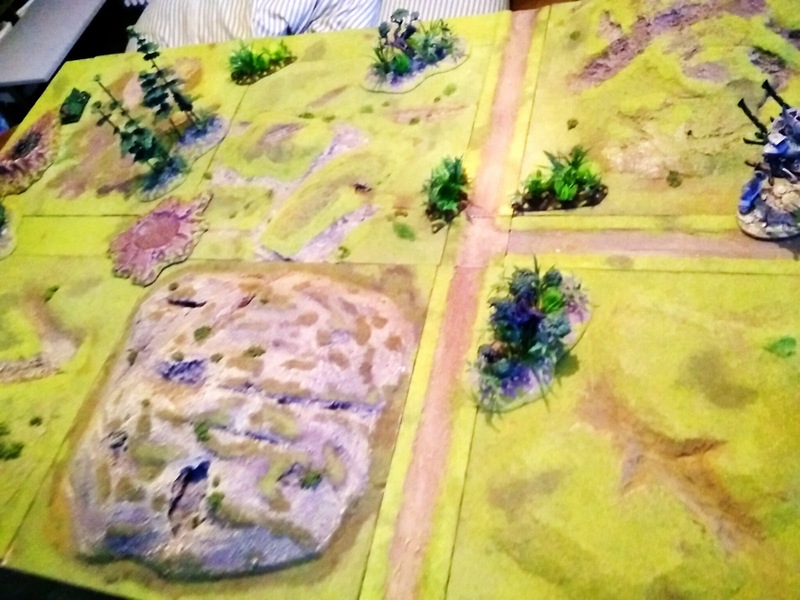 Night fighting first turn, lost deployment, went second and failed to steal the initiative etc. 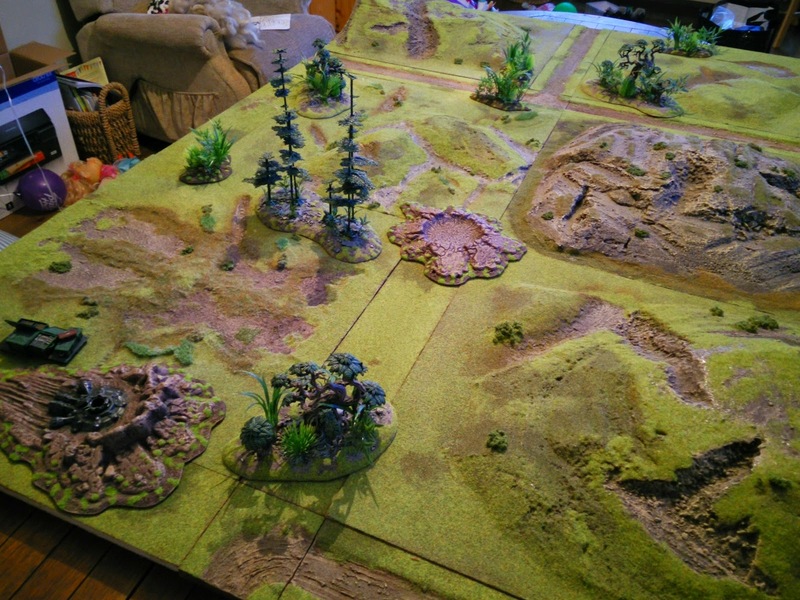 First of all Otty set up his modular board, there are some pictures at the end but this is really cool. 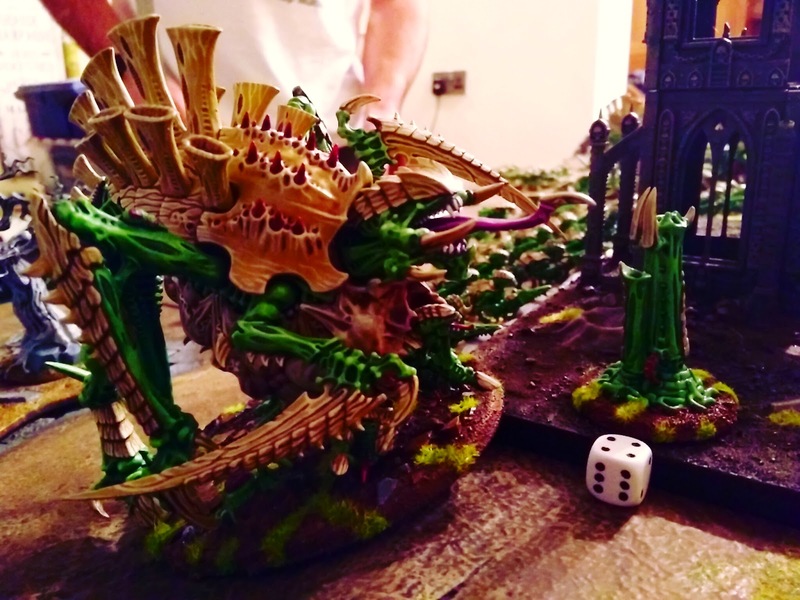 He spent ages making this and a few months after GW came out with the Realm of Battle boards but it's still nice to give it a go. 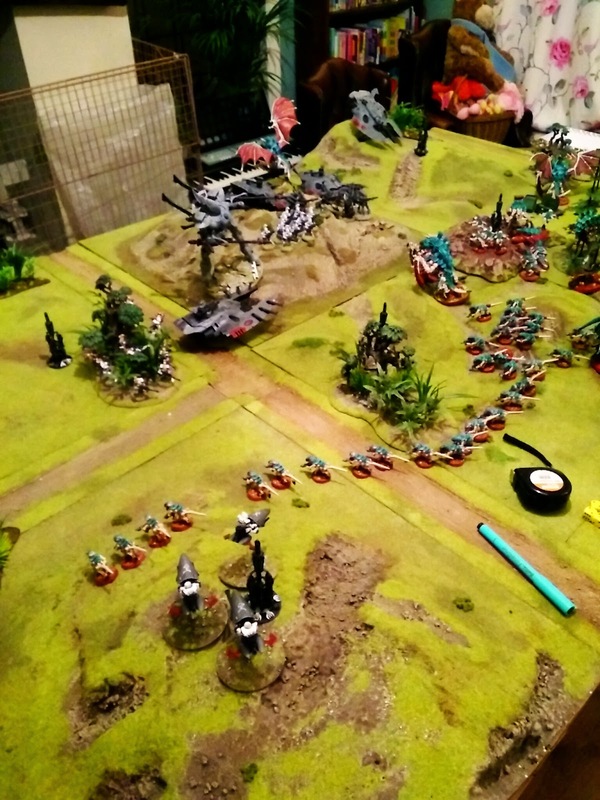 Anyway, setup meant going second wasn't too bad, what with my Warlord trait allowing me to infiltrate, however there wasn't many options and those three Wave Serpents were going to ignore most of the advantages my newly minted Malanthrope, cover from the crater and Night Fighting was going to give me. 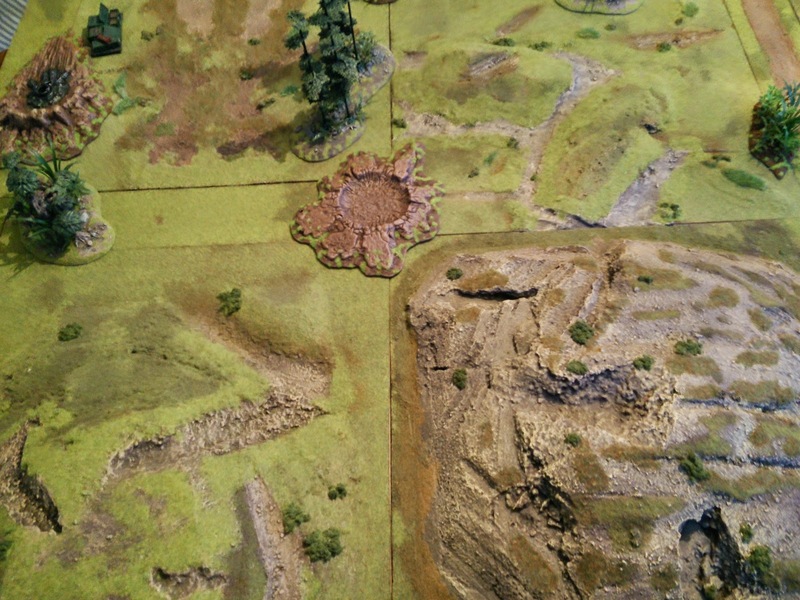 I contemplated deep striking the Flyrants but thought target saturation might keep me alive so bundled everything in the middle. As you can see it worked, after a fashion. My Warlord Flyrant took 3 wounds. Where's a Bastion to hide behind when you need one? 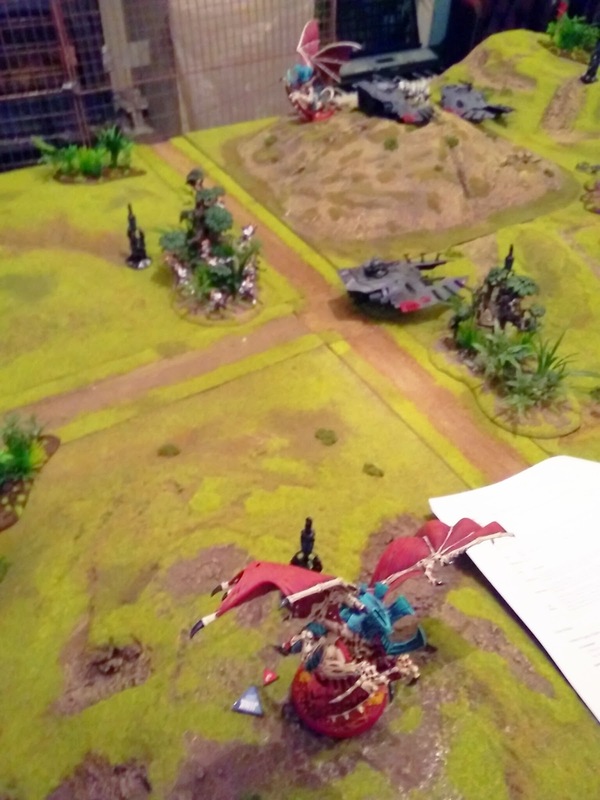 Well luckily for me at home as Otty had drawn destroy a Fortification as his objective, but with none available he threw all his Wave Serpent shots at the Flyrant but he managed to survive. 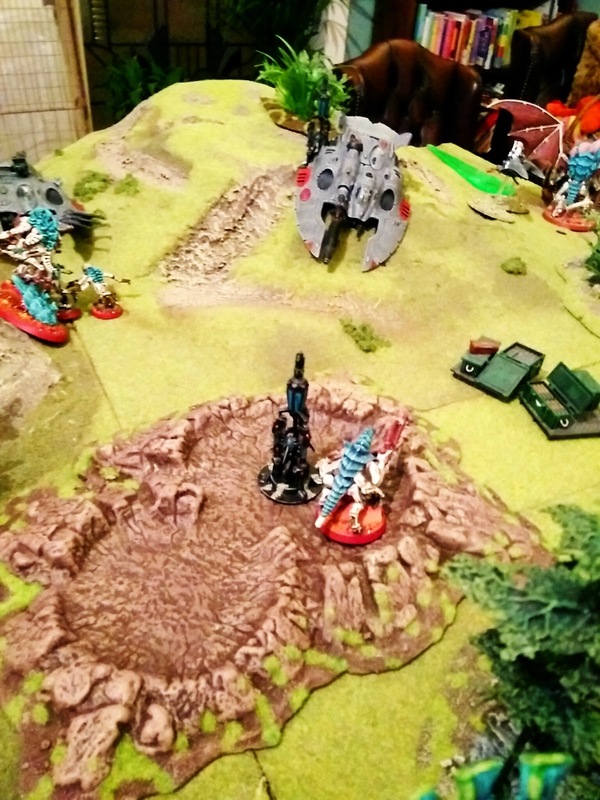 Meanwhile his Warp Hunter fired on the Tervigon, he survived the blast thanks to the Malanthrope and tree line but the second Flyrant took a wound. 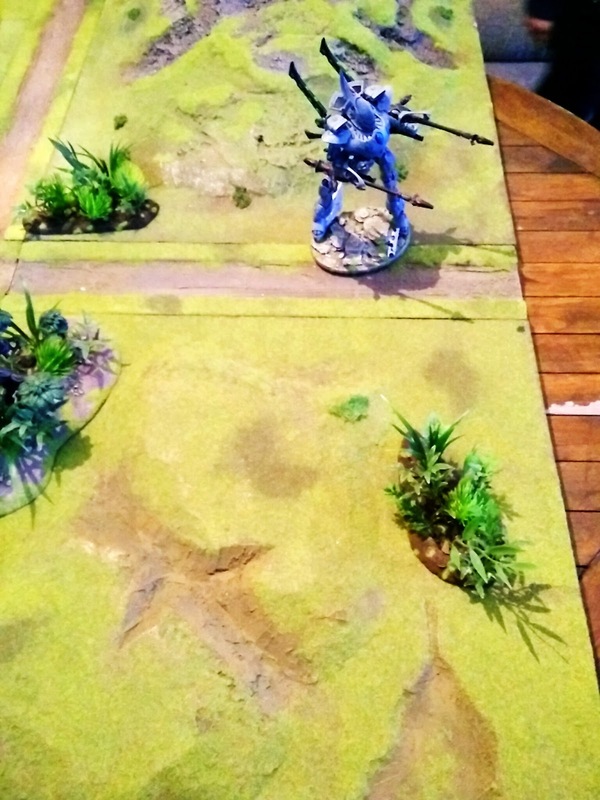 The swirling cloud from the Malanthrope must have affected the Wrathknight, he couldn't even hit them, let alone wound them, with both it's cannons. My turn 1 and already running into 9:10pm! 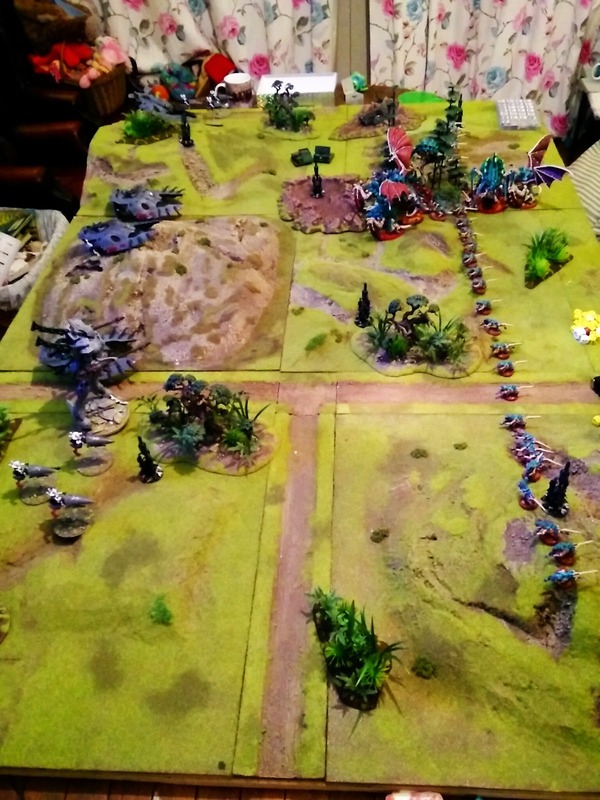 I spawn 12 gaunts, move everything up [obviously] but I'm looking to assault the Jet Bikes at the bottom, hoping to slingshot my entire Termagant conga line into Otty's back field. I'll lose an objective but I'm thinking the manoeuvre will pay up in speed. I've drawn the objective to score D3 VPs for killing Otty's Warlord so I target the Wave Serpent with the Seer inside, I unleash everything I have managing to wreck the tank gaining First Blood, but I've nothing left to get the occupants with. 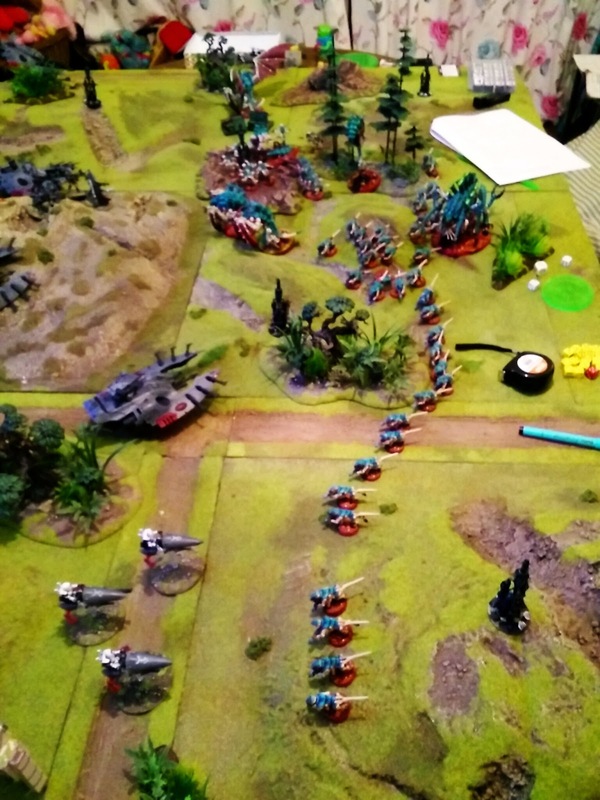 My Hive Guard whiff, and other Flyrant manages to break the Jet Bikes on the right flank. 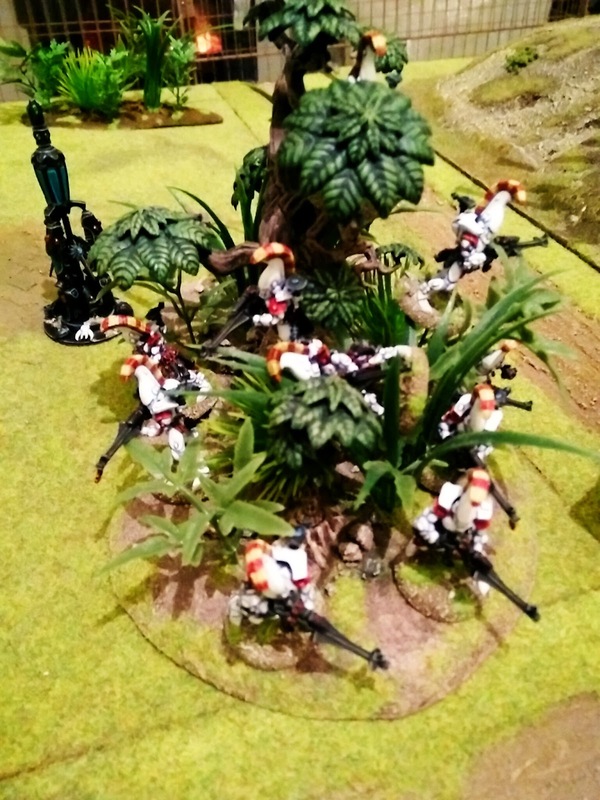 I've been slightly more successful than Otty but my Termagants need a 6" charge to get the Jet Bikes but can only manage 5" and fail to assault. 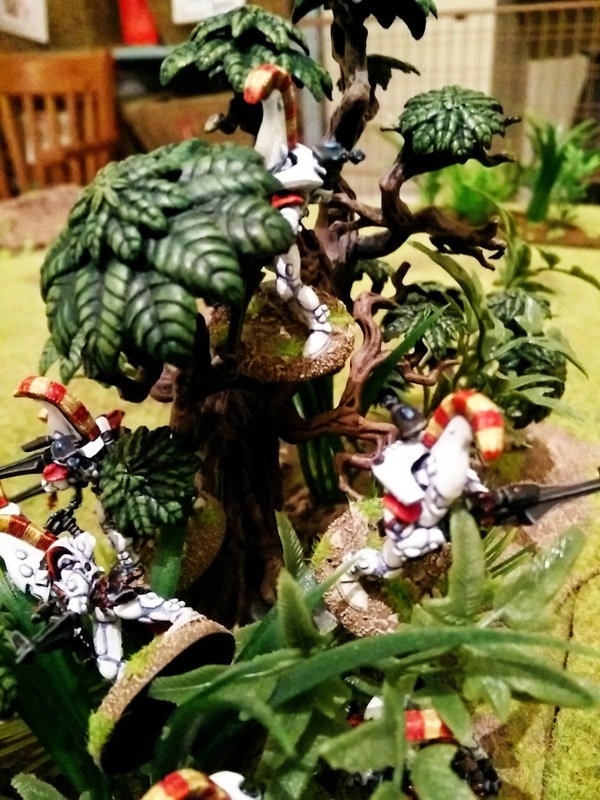 The Dire Avengers disembark from their transport and take cover, even in the tops of the trees nearby, securing another objective, Now Otty has to issue a challenge, something he can only really do with the Spawn of Cryptus or the Flyrants, who aren't going to get down on the ground to assault! 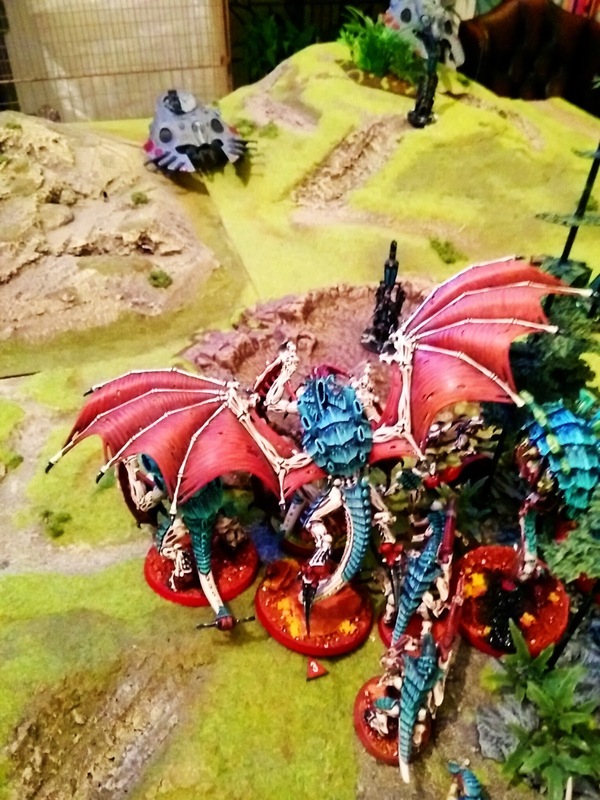 The FireDragons also disembark, I think there was some shooting on the Warlord Flyrant by the Wave Serpents but he managed to live through it. 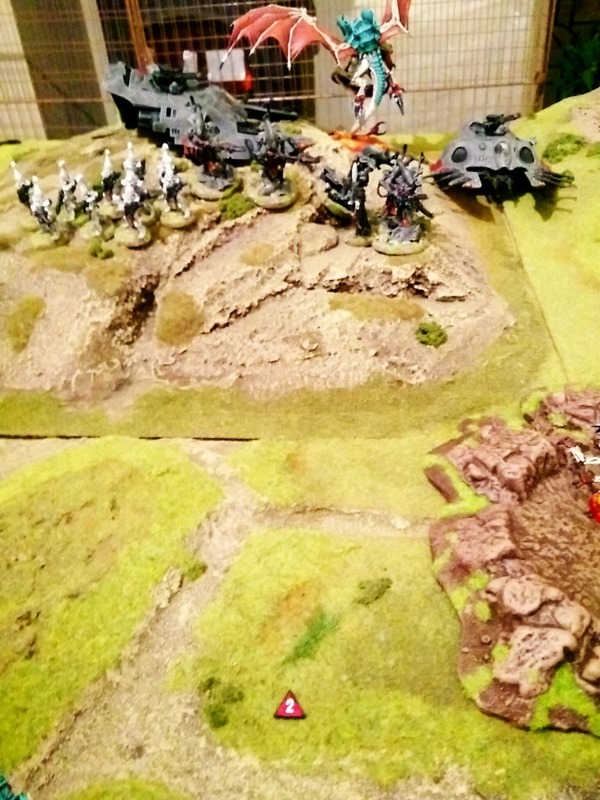 Jetbikes rallied on the far right and the other Jetbikes swooped over the heads of my thwarted gaunts to gain another objective. 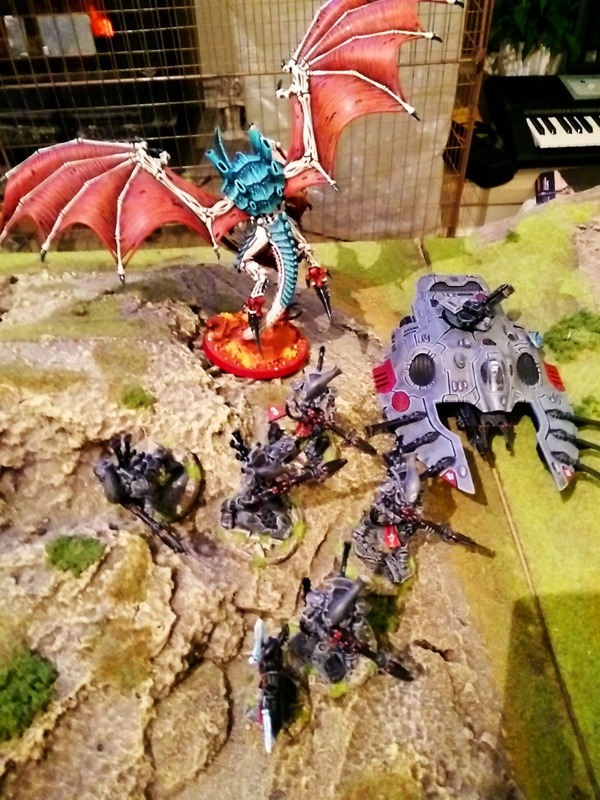 Fire Dragons and Wraith Guard target the Carnifex Brood killing one and wounding the other. 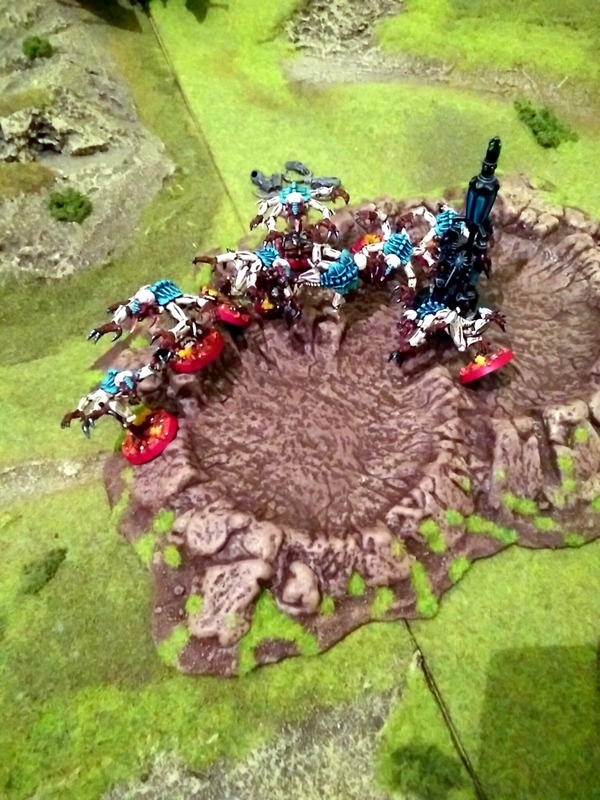 His last two wounds were taken so I was a bit disappointed my 300pts of dakkafex had gone in two turns. Still serves, me right for not supporting them with the Malanthrope, will learn next time. This gets Otty a VP for destroying a unit in the shooting phase. 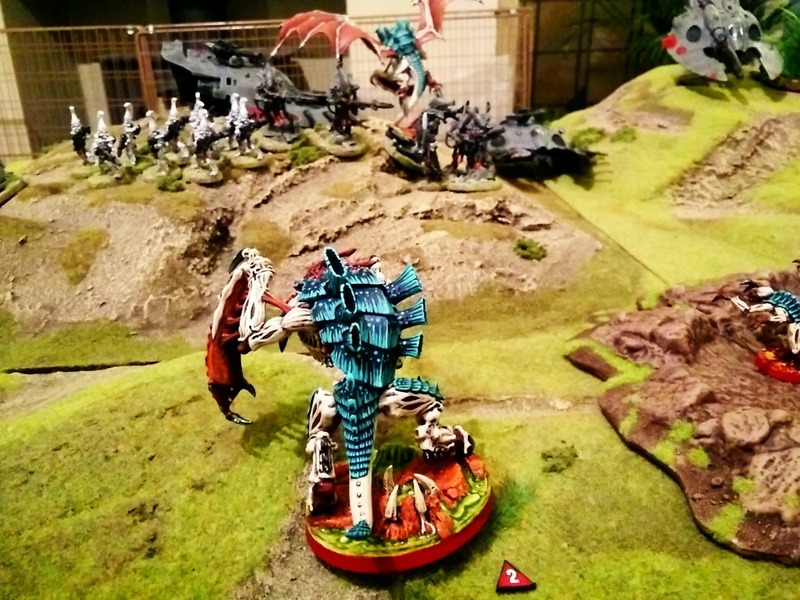 The Wraithknight trys to kill something and misses, again! My turn 2 and I manage to charge the Seer. The Spawn challenges but whiffs badly. The remaining Stealers also attack but not all get into range, I think I managed to wound once which Otty would subsequently heal in a psychic phase. 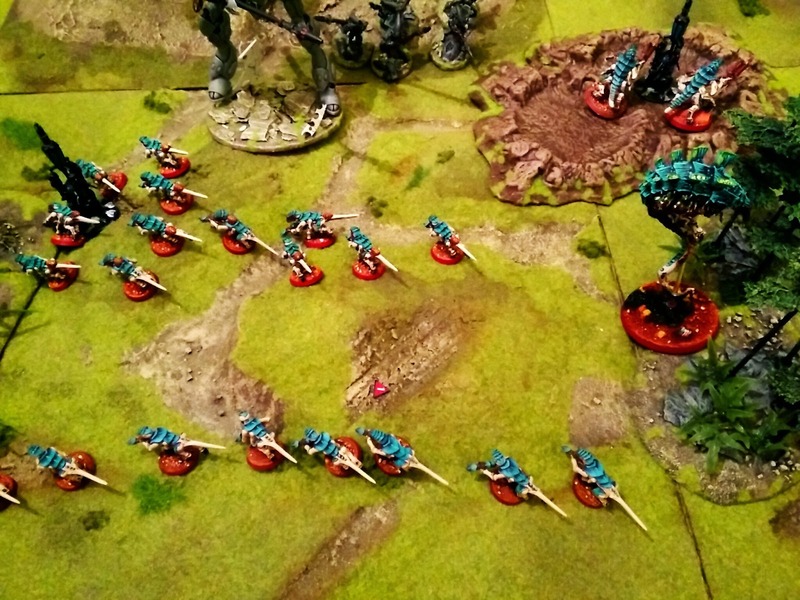 The melee ends in a stalemate somehow - 5 Stealers and a Broodlord against a Seer! 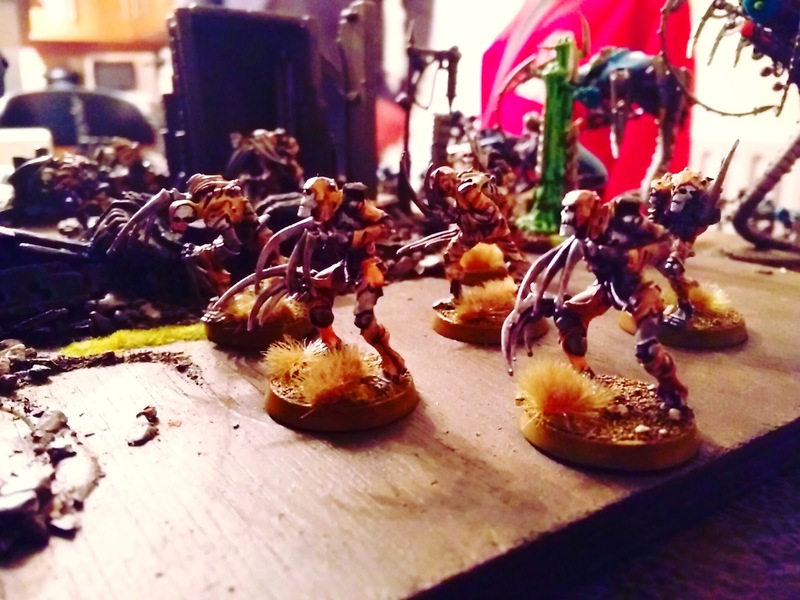 The Hive Guard move up to secure objective one, my new Tactical Objective card. 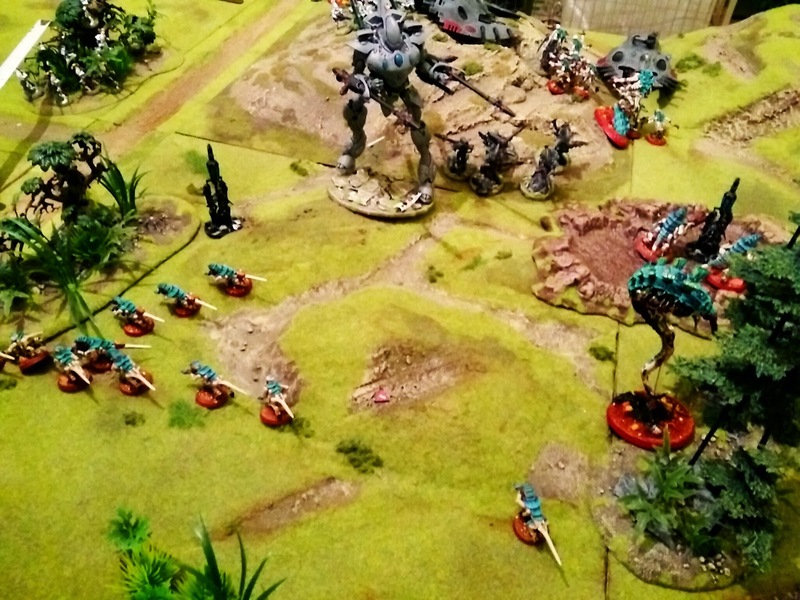 The Tervigon heads to the Wraithknight, the Miasma cannon missing for the second time in the game. 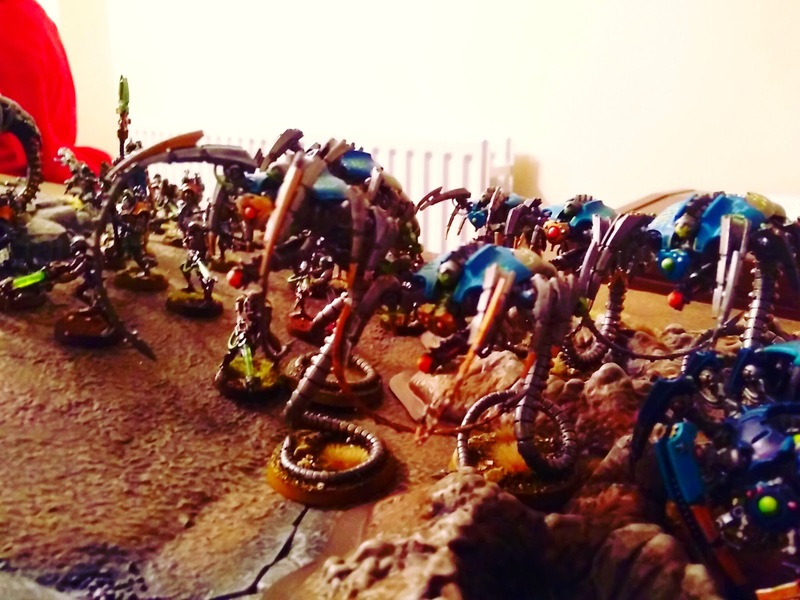 Out of shot on the right Flyrant manages to kill just one Jetbike with it's 12 Brainleach shots whereas the Termagants are far more effective with 9 Fleshborers in range on my left flank and kill two jetbikes! In Otty's subsequent turn the Wraithguard manage to instakill it with their D weapons. Just before this I realise I didn't spawn any gaunts, which is usually the bad omen that the Tervigon's demise is imminent. 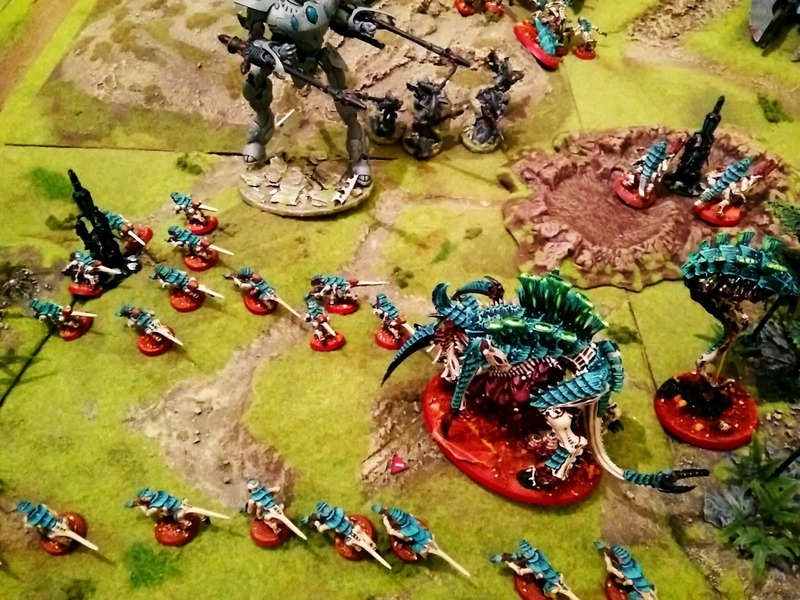 The resulting backlash kills all but four of the spawned gaunts who are no longer in synapse and bolt for the board edge. 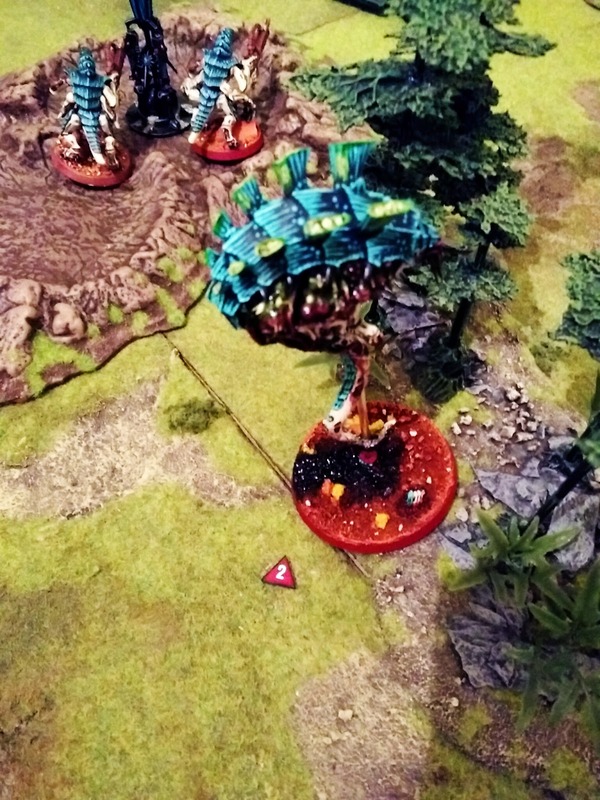 The big blob of gaunts only suffer 4 or 5 casualties but remain firm under the baleful gaze of the Malanthrope. 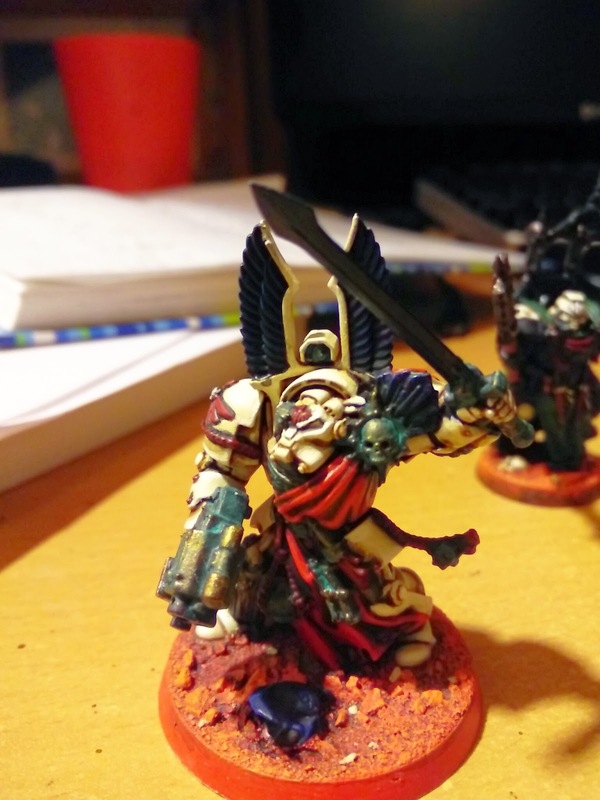 The Fire Dragons focus on the Warlord Flyrant, he is wounded 4 times by their melta fire. Luckily Jink manages to dodge three of them and I'd managed to cast Catalyst in my turn and this was the resulting FnP roll :) Otty was nearly chewing on the board at this stage, my Flyrant was nigh unstoppable. With the Malathrope proving to be a pain in the a$$ it was targeted and suffered two wounds, which he'd later regenerate one. Sweet justice the Seer falls to the overwhelming numbers of Genestealers, I get Slay the Warlord and 3 three VPs for having the Kingslayer objective. This puts me on 6 VPs to Otty's 2. There was however a point where Otty had objective two cards, one was D3 VPs if you control at least two objective and at least twice as many as I did. He also had D3+3 if he controlled every objective. I pointed out it was possible for him to get all 6, he just needs to kill the Hive Guard, unfortunately he can only kill one of them, but he manages to have twice as many as I do and gets 4 VPs in one turn taking us to 6 all. The Malanthrope charges through the crater, to engage the Wraithknight, it overwatches and hits, but I make my cover save from the crater. This allows the stealers to charge through the crater and attack the knight first because it's already engaged. I do my maths wrong and roll 24 dice to hit [instead of 32], eventually causing 4 wounds. 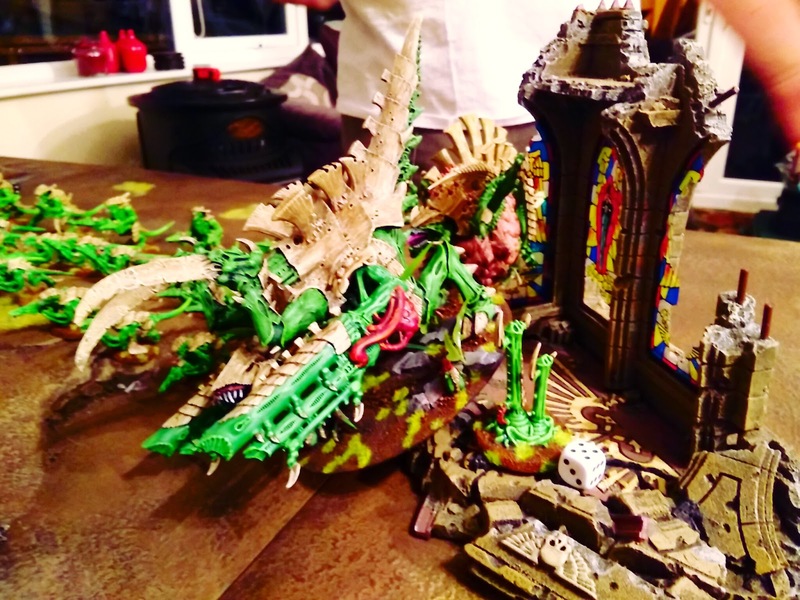 With the Malanthrope still to assault the knight squishes it flat instakilling it as S10. we remain locked in combat. The stealers making their second attack doing 24 attacks, scytals make the difference, if only I could have had toxins on these too! 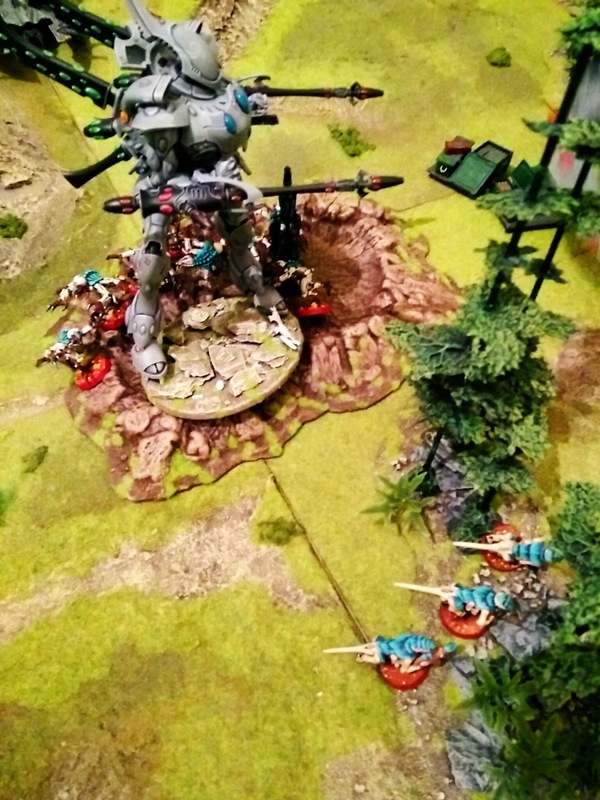 The Wraithknight gets slaughtered but it's too little too late. 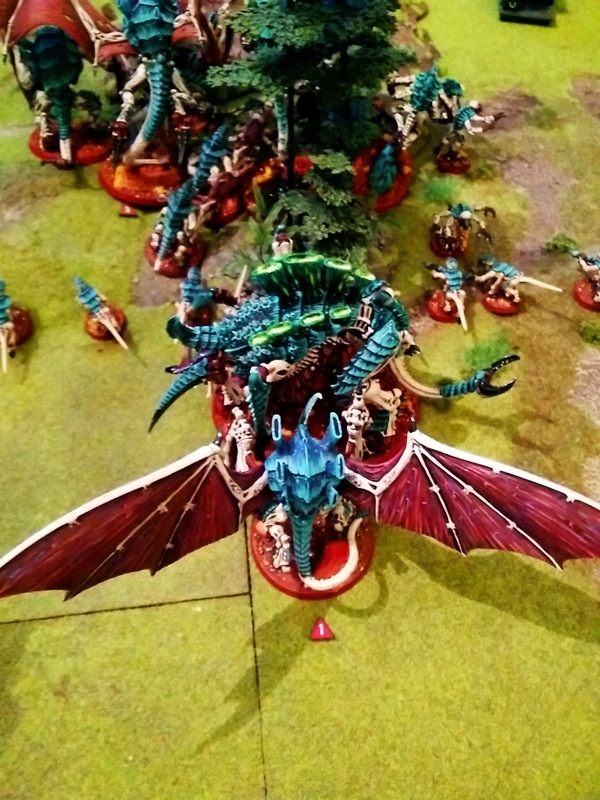 The Wave Serpent on the objective with my Flyrant means I cant score. 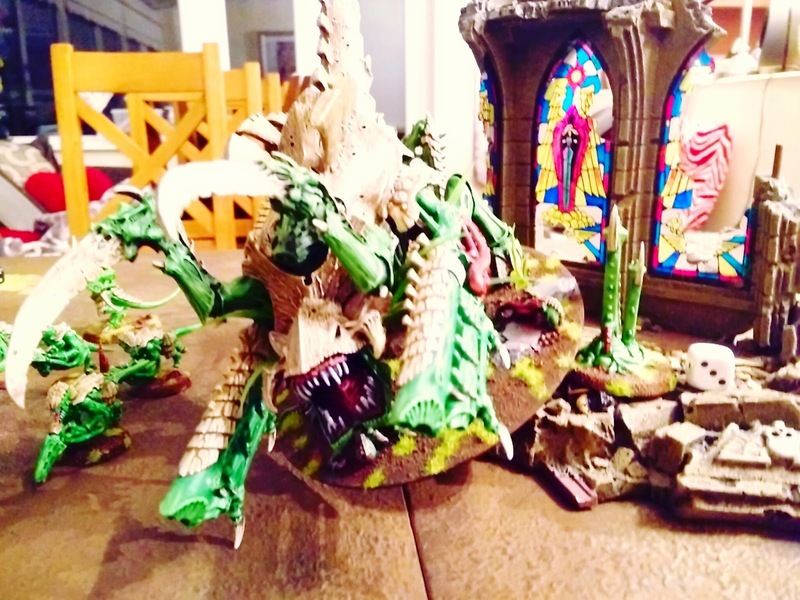 I've failed to do more than 1 Hull Point with my Devourers, electroshock could give me one, or I could Vector Strike for 1 but the remaining two might be jinked. Even then I'll be either on the ground in front of it at AV12 so I can have the objective or swooping over it, lose the objective but get AV10 rear shots. Either way I can't get it. I was seriously lacking in options due to not controlling objectives, I played far more aggressively, the exact opposite of my last lessons learned, and although I was a bit disappointed [I'm looking at you Carnifices] I had a lot of fun with it. Can't wait for our next game. 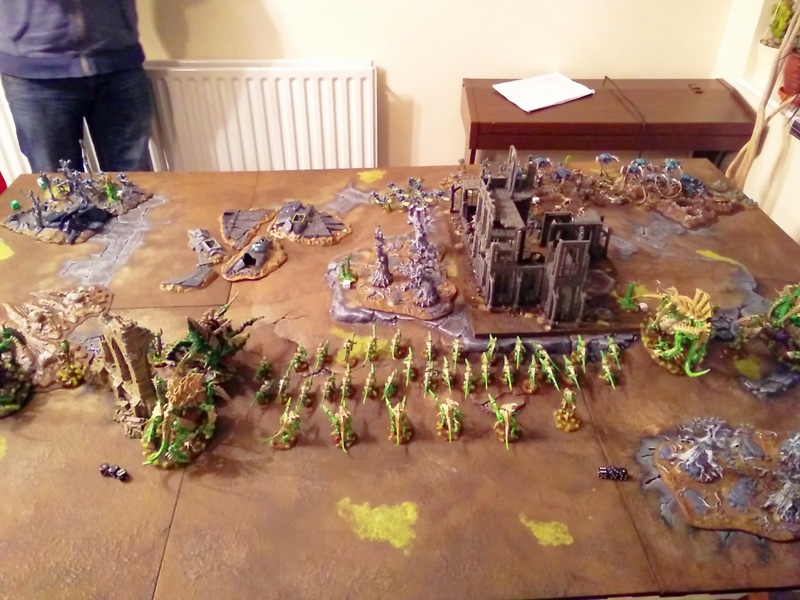 Here's the promised shots of Ottys table without models on. 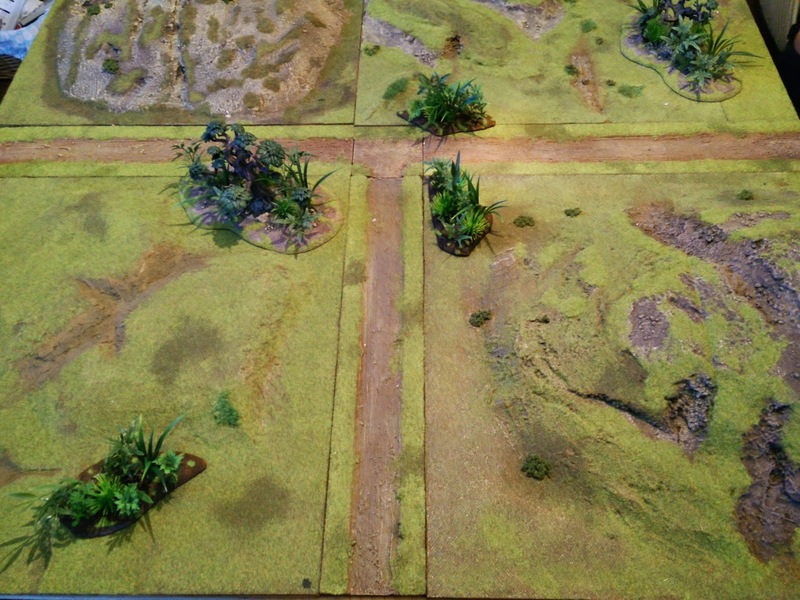 Each board piece is 20" square with sections that are 4", either plain or as roads and you can position them how you wish to make varied layouts. It was nice to play on such an interesting boars, although wobbly model syndrome was prevalent.